A pulse oximeter sensor is used with a finger pulse oximeter in order to collect the data from the wearer's blood, sending it to the monitoring unit. Although a fingertip oximeter is most commonly used for the purpose of blood saturation (SpO2) monitoring, toe sensors may also be used or, in the case of neonatal patients, an SpO2 sensor may be attached to the bottom of the baby's foot. Pulse oximeters serve the dual purpose of monitoring SpO2 and pulse rate. To accomplish this, they utilize a combination SpO2/heart rate sensor. 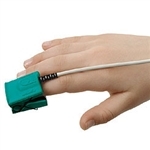 The finger oxygen sensor models, found here, include the articulated clip-on types, available in adult or pediatric sizes. We also carry flexible, cloth sensors and cushioned, foam sensors. Whatever your preferences are, we only carry sensors that provide the most accurate and precise readings - for your optimal health! Concord carries only high quality Pulse Oximeter Sensors from trusted manufacturers. Concord carries Nonin Medical Pulse Oximeter, Masimo and Concord Health Pulse Oximeter sensors. Concord Health Supply offers FREE UPS SHIPPING on all Pulse Oximeter Sensor orders. © 2018 Concord Health Supply, Inc. All Rights Reserved.